Paella is one of those festive looking dishes that is as much a feast for the eyes as it is for the taste-buds. With a base hue of bright yellow and splashes of red and green throughout this dish is as synonymous with Spain as tapas or sangria or really bad wine hangovers for that matter. Originating in the rice-growing region of Valencia, Paella was traditionally a dish to feed farm workers and peasants, but aren’t the best? Consequently, it was bulked up with whatever was at hand, typically rabbit, chicken, snails and beans dependent on the farm location with each region adding their own twist; like seafood which is not in the original incarnation of paella, however is now a popular inclusion in variations found by the coast. While within reason you can throw just about anything into your Paella there is one crucial rule that you must follow – DO NOT STIR! Paella is meant to be a dry rice dish that relies on the delicate partnership of absorption and evaporation. At the end of cooking, the aim is for the surface to be pitted with holes and the base crusty, crispy and slightly caramelised. This is called a socarrat and is the sign of a good Paella. Heat half the oil in a Paella pan or a large flat pan over a medium heat. Add the onion, garlic and chilli and fry until translucent. Add the rice and chorizo to the pan and allow to fry, constantly stirring, until the rice and chorizo turn golden. Do not freak out that the chorizo will release oil, this oil will act as a delicious flavour base for the Paella. Add the remaining oil, chicken and all spices, salt and pepper to the pan and fry until fragrant the chicken has browned. Add the stock, cover, turn the pan down to a simmer and allow to cook for ten minutes. This is where you will stop stirring. If your burner is not big enough to directly heat the entire pan ensure you are rotating the pan every two minutes so that your Paella cooks evenly. Uncover and add the prawns to the Paella by pushing them into the rice mixture with the tails slightly visible at the top. Cover and allow to cook for another five minutes. 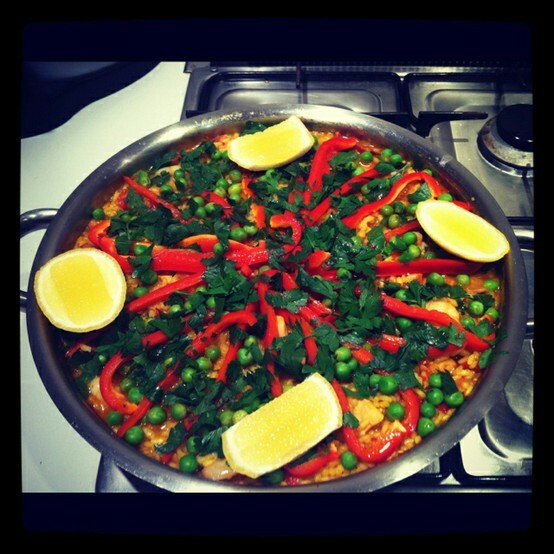 Uncover the Paella and check the consistency of the rice and the amount of liquid in the pan. The rice should be almost cooked and almost all of the liquid absorbed. If the rice is still hard and there is not much liquid you will need to add a little more, use your best judgement but you shouldn’t need anymore than 250ml. Pour the lemon juice evenly over the top of the Paella, arrange the capsicum strips to fan out from the centre of the pan and sprinkle the peas over the top. Cover and allow to cook for another five minutes. Remove the lid from the pan, sprinkle with chopped parley and arrange with lemon cheeks. Serve the pan straight to the table for your guests to serve themselves.